What do an Amiga A600 and the Raspberry PI have in common? Well at the time of their release, both were considered small micro computers. So what do you get when you combine the quad core power of a RPI-2 Model B and the compact design of an Amiga 600? In theory, a compact quad core Amiga, that runs Linux. But that’s just a theory right? No one’s actually gone to the trouble of making such a freaky hybrid have they? Well actually yes, in fact plenty of people have been putting Raspberry Pi in all sorts of things, ranging from Spectrums, C64s, toasters and pants. Ok I made that last one up, but you just wait, the day is coming when someone will develop digital ‘smarty’ pants. That day is coming my friend. Most of the time the A1200 and A500 are utilised for modding purposes, most likely because of the space afforded in both machines. As a kid at the time, I recall thinking the A600 looked like a waste of time compared to my expanded A500+. It wasn’t until later that year, when I saw the A1200 in Amiga Format, that I began drooling. Fast forward 23 years and here I am staring at a 600 case, wondering what I can do to it. In my head, I was picturing a useful Linux machine capable of going online, playing games and running UAE (Ultimate Amiga Emulator). I had a Keyrah sitting on the shelf begging to be used, so what am I to do? Initially, I did nothing. Back when the Raspberry Pi was first released, it was intended for hacking LEDs & light sensors together or acting as the brains inside an electronic project. It wasn’t meant to be a desktop computer, it simply didn’t have the memory or power to handle it. Gradually, the Pi evolved, more RAM was added, the design was refined, software was optimised, until finally the Foundation released the Raspberry PI 2 Model B. Upgrading the tiny computer with a quad core Arm Cortex A7 processor, this update opened the door to variety of new possibilities, including my shelved Amiga project. The Pi is very affordable when you compare it to other SBC boards. It also has the benefit of a rich and active community. Not to mention the copy cats that have emerged since its release. While some people might critisise them, I think it’s ace – competition is healthy. Children are once again wiring up things to their computers, learning how to program, learning LOGIC. Some of these kids might go on to shape our future and possibly develop the next breakthrough technology. But in the meantime, here at ByteMyVdu, we are more interested in seeing if a RPI2 can be merged with 20 year old Amiga…So read on and find out. Even before I started drilling or ordering parts, I knew one thing for sure, I wanted the hack to be neat, not just that, I wanted the Amiga PI to look no different to a regular Amiga. I wanted people to see it sitting on my desk and think it actually was an Amiga running Linux. But how to go about it? After all the RPI has vastly different ports to the Amiga. Instead of serial and parallel, we now have USB, and in place of composite there is VGA or if you prefer DVI / HDMI. There is also the RJ45 port, allowing you to hook the PI up to your network. Back in the day, the Amiga used serial or a PCMCIA modem to talk to the outside world. One thing was for certain, the back of the Amiga was going to look vastly different with all the new ports and connections, utilising the existing holes cut in the case would only end up looking odd. So I decided to craft a new back panel from 3mm acrylic. Taking measurements of the rear panel of the A600, I spent a Saturday designing a vector on my Macintosh Classic. Originally I’d been planning to write an article for BMV about the Manchester Play Expo, but the idea popped in to my head that it would be more fun to design the back panel. Surprisingly the process was very easy and transferring the design over to the main computer went without a hitch. So anyone who says that 68k Macs are useless really needs to have a rethink. With the back panel cut from white acrylic, I began buying the cables necessary to extended the ports of the PI to the rear of the Amiga case. I shopped on eBay for all the things I needed, while Amazon might have stocked them, I wasn’t so enthusiastic about buying from them after being burnt in the past. With all the cables together, I went about installing the new back panel. Having already cut out the back from the Amiga case, I offered the new panel up to see how it look. Fortunately for me, my measurement had been pretty good and the new panel fit nicely against the back of the A600. Once the case was together, it was time to attach all the cables, screwing and gluing them in place where needed. While doing this, I discovered a handy Y shape USB splitter on eBay, turning one USB port in to two. It was only after I had installed the cable, that I discovered the splitter was only good for charging. No matter what I hooked up to the ports, nothing would appear. The only device that DID work was a mouse, pretty much cementing the fact, that the cable was complete rubbish. Luckily I’d bought two USB extension cables prior to seeing the splitter, so it was just a case of swapping the cables around. Even though I had glued the splitter in place, I was still able to extract it. With the new cables installed, I now had two fully working USB ports on the back of the case. As for the USB splitter, it went in the bin. The next step was installing the Keyrah. This little device from IndividualComputers turned the Amiga keyboard in to a USB device, enabling me to use it on the PI, so it was important I found space inside the Amiga to accommodate the PCB. Imagine my surprise when I discovered the joystick ports on the Keyrah lined up perfectly with those on the 600 case. I’m not sure whether this was intended, needless to say it made installation easy. The Keyrah does sit rather close to the floppy drive, which might cause problems in the future, should I wish to fit a disk drive. Later models of the Keyrah have a slot for connecting the keyboards ribbon cable, but mine is an early revision. 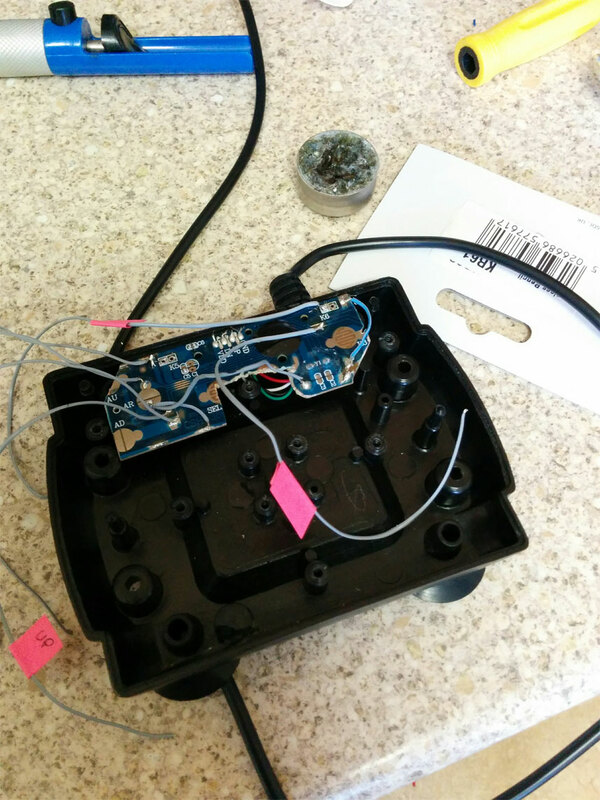 So instead of a slot, the contacts are printed on to the PCB and a bar is used to hold the ribbon cable in place. All I shall say on this earlier design, is that I understand why they changed it. Every time I open the AmigaPI the ribbon cable would move, taking out the keyboard. Keyrah, handy kit so long as you leave it alone. Because of the limitations of the A600 keyboard, the Keyrah has an on board switch, that swaps between two keymaps. Essentially giving you access to a full keyboard. Because the Keyrah resides inside the Amiga, I’m not sure exactly how they expect me to access the switch. Unless I was meant to cut an ugly hole just below the floppy drive, hmm I don’t think so! Perhaps at a later date, I will wire up a new switch and mount it on the back of the Amiga. One final aspect to wiring up the Raspberry PI with the Amiga case, was case lights. In what has to be the most hairy bit of soldering I’ve done. I removed the surfaced mounted LEDs from the Raspberry PI to gain access to the solder points below. Then using some IDE cable, I attached wires from the motherboard directly to the legs of the LEDS. Holding my breath, I turned the machine on and what do you know, the power and drive light came on. 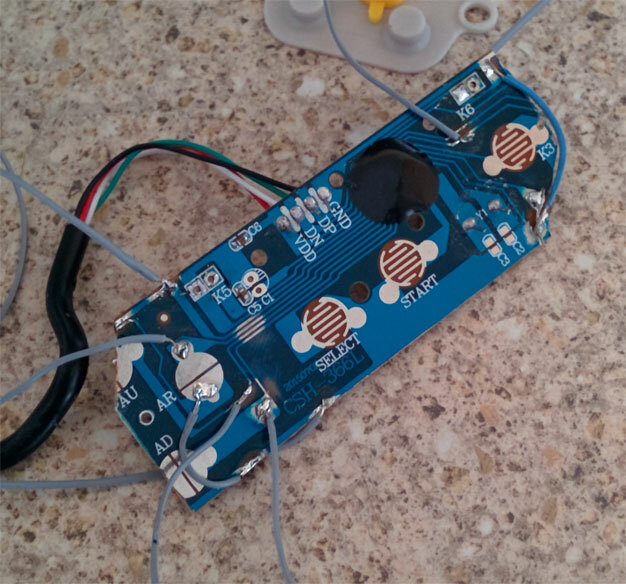 Not the sort of soldering I want to do on a regular basis, as my heart was in my throat the entire time I was soldering to the tiny PI board. The combined power requirements of all these devices undoubtedly pushes a PI to it’s limits, at it’s best the PI has 1.2A devoted to the USB bus. If one or two of your devices are power hungry, the 1.2A cap can quickly become annoying. The only solution is to use a powered hub, which is exactly what I did. Due to the limiting space factor, I tried to avoid using as many connectors as I could inside. 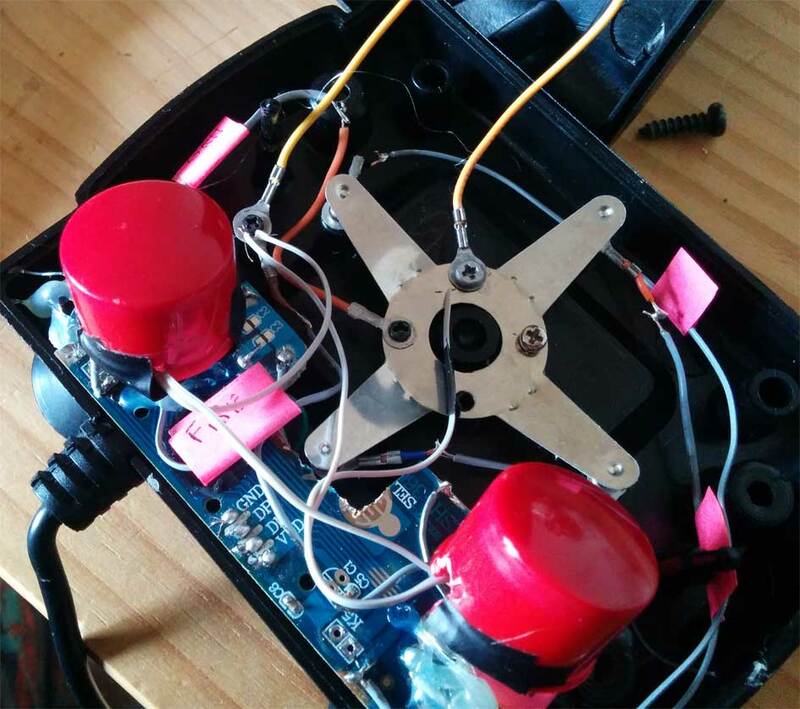 Instead opting to chop the ends of cables and solder the wires directly to the points on the hub. The PI hub has a 5v 2A port dedicated for powering the PI, so instead of using the intended USB cable, I soldered wires straight to the 5v and ground. I then soldered them to the power points on the PI motherboard, just below the micro usb power port. I also converted the power socket of the hub in to a female micro USB socket, which I glued to the back panel of the Amiga case. This meant I could continue using PI specific power supplies. Soldering all these wires together, I made a very rookie mistake, by not taking in to account the resistance of the wires on the whole circuit. This became apparent the first time I booted up the PI. Even though I was using an official Raspberry PI psu, the square rainbow under volts icon appeared in the top right corner of the screen. Running a volt meter over the ground and 5v pin on the GPIO port, I discovered it was reading around 4.5v, not the 5.15v that I was expecting. If there is one thing I learnt during this build, it is that USB cable makes a poor substitute proper gauge wire. 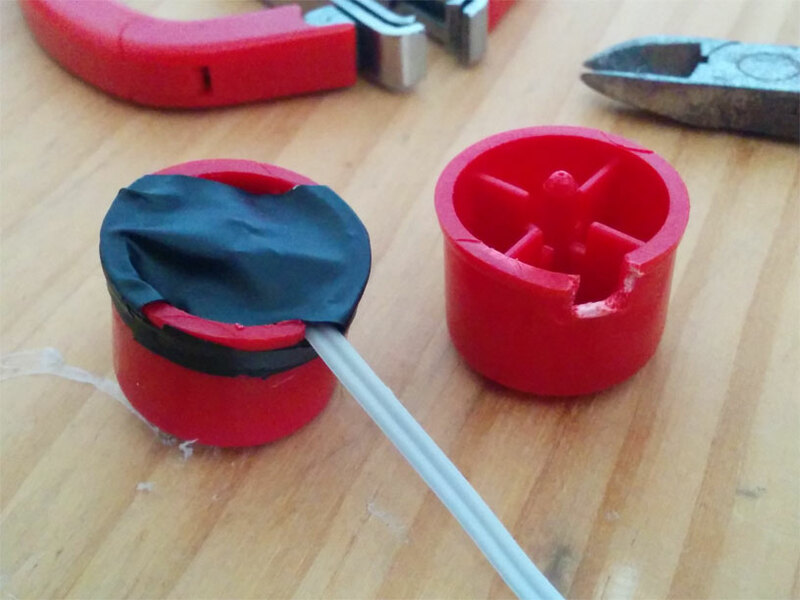 If you want to reduce high levels of resistance, make sure to use a decent gauge wire. I learnt this lesson the hard way, leading to me to rewire everything a second time. After which the voltage over the GPIO port was restored to just over 5v. The original psu for the PI hub is rated at 5.2V 2A, which is more then enough to power a PI under normal circumstances. In the AmigaPi’s current configuration, it appeared just enough to power everything, the under volts icon appears whenever the rear ports are in use. With this in mind, a 3A power source will likely be on the cards. Under the hood the AmigaPI runs the latest version of Raspbian, I have also installed UAE4ARM, the lastest Amiga emulator for the Raspberry PI. Not only does it receive regular updates, but it quite possibly the fastest Amiga emulator you can get on the PI. Configuring it to work can be a little tricky and keyboard support is not all there yet, but anyone who spends time reading on the Raspberry forum have little trouble getting it running. There are a surprising number of Linux games available for the PI, ranging from Doom clones to arcade Galaga, you can even get point and click adventure games such as Beneath a Steel Sky. All of these work fine with the Raspberry Pi and are definitely worth a look at. DOSbox is also available I’ve yet to test it out, so I can’t say how good it is at emulating a DOS machine. But if UAE is anything to go by, it will hopefully manage 486 games without breaking out a sweat. As I mentioned earlier, I wanted the AmigaPI to look like an Amiga, with working Joystick ports, a functional floppy drive and PCMCIA port. Admittedly the rear of the computer looks different, but that couldn’t be avoided. The PI doesn’t have a serial or printer port like the Amiga, nor does it have an composite or RF connector. The only option I had was to give the new back panel an Amiga feel, which is why the power connector is in the far corner, why is has phono connectors for audio and two USB ports, in place of the old serial and parallel ports. The floppy drive is still a work in progress, as the floppy to USB adaptor I bought is sitting on my desk untested. Until I have a new power supply, I don’t wish to risk corrupting the SD card by causing a brown out. But hopefully in the near future the familiar click of a floppy drive will return to the old A600 case. Fitting the Amiga PI with a PCMCIA port seems a little redundant to me, as I had an old CF card reader kicking around, I decided to compromise. After all, when my A1200 isn’t on WIFI, it spends most of its time with a CF card adaptor stuck in the side. Equipping the AmigaPI with CF, meant I could easily transfer files, pictures, mods and ADFs back and forth between the AmigaPI and my regular Amiga’s. Something I envisioned being pretty useful at LAG meetings, when we are taking pictures of the meeting. I honestly can’t believe I’ve finished this project, that I’m sitting here at this moment, typing on what looks like a regular Amiga 600. Except the badge bares a berry shaped logo and next to it, reads Raspberry A600PI. Ok it’s not a next generation Commodore product, but then when are we likely to see that happen? The reason people are still rocking Commodore products is because of the mindset behind them. The passion that drove the team who made the Amiga, still lingers, the embers faintly glowing from a fire that blazed decades ago. All I know DO know, is that I get a certain buzz from using a computer that fits inside a keyboard. Unlike my Windows 7 tower, I can thrown the A600PI in my bag and take it with me and who knows, maybe even play a game of Sensible Soccer over at a mates. Yes its dirty filthy nostalgia but on top of that, it’s turning the PI from a mass pile of wires, in to a compact, usable computer. I only have to connect power, VGA and mouse to get the AmigaPi up and running. Everything I need, is self contained within the confines of the A600 case. With a regular PI, I have to find my VGA to HDMI adaptor, WIFI dongle, powered hub, keyboard and mouse, before I even begin to think about powering it on. In short, its a real faff, but not any more! So if you’ll excuse me, I feel the need to play Cannon Fodder now, till next time keep on geeking!! No Amigas were harmed during the making of this project, but one ropey looking, long dead 600 was given a new brain. Can you believe it? The famous Lucasarts title, celebrated its 25th birthday! Released on October 1990 for the Amiga, Atari ST and Macintosh to name a few. The game was a smash, with critics of the time praising its humor, game play and graphics. So popular was the title, that is spawned a sequel, Le’chucks Revenge. LucasArts released a remake of Monkey Island in 2009 for Windows, iOS, Xbox 360 and PS3. This ‘special edition’ featured new hand-drawn visuals, a remastered musical score, as well as voice work for characters and a tips system to aid struggling players. Developers included a function in the remake, allowing players to switch between the 2009 and original 1990 audiovisuals. Ron Gilbert first conceived the idea for Monkey Island in 1988, his frustration with other adventure games of the day led to him making it impossible for the player to die while playing. Something that could happen to you without warning in Sierra’s point & click adventures. Ironic that the first ‘point&click’ I played on my A500+ was Space Quest. After playing through that game, I played Monkey Island with an unshakable certainty that I would eventually wind up killing Threepwood. So when he first fell off a cliff in the game, I stared at the TV with despair, then bewilderment. When a few moments later, he bounces back, saved from death by a rubber tree. The playful, parody of the Sierra “Game Over” screen is a nice touch and typical of the humor found in the Monkey Island series. To which Gilbert, Schafer and Grossman are responsible for. Together they wanted to develop a more accessible game compared to previous LucasArts titles, where amusement and exploration are key elements. Perhaps it is this approach that has made the franchise so popular, Monkey Island was innovative game for its day and is still enjoyable today through the 2009 remake. If you’ve never played the game before, I highly recommend buying a copy via Steam. To say that I’ve tried my hand at brightening up some of my older machines would be an understatement. I’ve tried doing it to an Amiga 500, an 1200 and even an old Macintosh ADB keyboard that had gone rather yellow. The only success I’ve had to date, was with an Amiga mouse which I changed from smoker’s yellow to having a slight case of jaundice. I’ve never had the shocking ‘Wow’ factor results that other people have posted online, it’s been something of a white whale. So it’s no surprise that every now and then I find myself coming back to have another go, this time with two Apple Pro USB keyboards. Less than 10 years old, both look like they came from a heavy smoking environment, when in actuality they were white when I put them in storage. Clearly, being boxed in the attic has not done them any good. I started with the worst of the two and began stripping it down, removing the keys into an ice-cream tub. I then painted the main keyboard with some 40% Blonde hair bleach, which you can pick up from Boots and Home Bargains here in the UK. In the past I have tried using solutions of Peroxide, mixed with wall paper paste. This ended up ruining the A500 case I had tried restoring. Using the little gold bottle of hair bleach had been suggested to me by Merlin. No not the Wizard(!) but the Amibay username of the chap who came up with Retr0brite to start with. After a lengthy discussion via Skype, where I felt increasingly in over my head, Merlin aka Dave Stevenson finally said I should forget all about mixing bottles and just go for the easy approach. This was great news as up until then I’d begun to think to do Retr0brite you required a PHD in potions and wizardry. So cancelling my application to Hogwarts, I waited patiently for sunshine and in Yorkshire you have to be patient. Fortunately I was able to bag two good days of sun, albeit with the occasional shower. The results took me by surprise. While the main body of the keyboard had been covered in cream peroxide and wrapped in cling film. I’d submerged the keys in a solution of 40% vol peroxide and hot water, with a little oxi vanish mixed in. The keys had only slightly brightened up, where as the keyboard while not restored to its original ivory white, was noticeably less yellow. For now, I’m biding my time until we have more sunshine. Then I plan to apply cream to the keys as well and see what the results are. For now I think it is fair to say that I’ve given up using liquid peroxide, in favour of using cream. So keep watching this space folks! Things have been a little quiet here on BMV, but that isn’t to say that there hasn’t been any geeky goings on behind closed doors. At a recent Amiga club meeting, a member of the public brought in their old Amiga rig and software. Left to gather dust in their attic, they brought it to LAG hoping to find it a new home. By sheer coincidence I had brought along my own Amiga 500 Plus to the LAG meeting, along with an external hard drive I was trying to install games to. Having owned an A500 back in the day and only ever used the floppy drive, I was eager to experience all the IDE goodness. Sadly my Amiga was choosing not to work with the GVP expansion, so when the offer came of a free boxed A500, I jumped at the chance. When I opened the boxed, I discovered it was complete, with manuals and polystyrene packaging, just as it had been the day it was sold. From what I gather the A500 is faulty, so I will have to check it out when I can get around to it. Along with his A500, the gentleman brought in two boxes worth of Amiga games. Sifting through them, I found titles such as Desert Strike, Monkey Island, Rocket Ranger and Castle Master. All classic games in their original boxes. I goes without saying that a number of the games ended up coming back home with me and it’s a sure thing I will be reviewing them here on my blog. Sure there are plenty of places online filled to the brim with Amiga game reviews. But as I seldom review games, I figured what the hell, why not have a go. Besides that is what ByteMyVdu is all about, talking, discussing and reviewing everything old bit of computer kit I can get my grubby hands on. 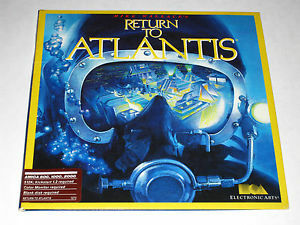 In the next couple of weeks, I’ll be writing about repairing or trying to repair an Nintendo 64 and also doing a review of “Return To Atlantis”, one of the games acquired at the LAG meet. A couple of years ago I wrote an article on BMV about a retro themed computer I’d built, designed to look like a Z80‭ Micro ‬computer from late‭ ‬70‭s. ‬The build went pretty well and overall I have to say it was a success.‭ The front panel even had blinky lights! ‬But like many prototypes, there were one or two unanticipated bugs.‭ ‬Today’s article will cover the biggest of them all: heat, and how its ultimately in your own best interest not to ignore it. So pull up a chair, grab a hot beverage and lets get the party started. At the heart of the Nomad is an MSI Fuzzy‭ ‬945GM2‭ ‬motherboard, fitted with an Intel Core Duo T5500‭ ‬central processor and 2GB of DDR2‭ ‬memory.‭ ‬By today’s standards the hardware isn’t very impressive,‭ ‬but powerful enough to run old DOS games, emulate other systems and still provide a decent working system. Windows XP Professional, while not so safe online, is still the best option for running most old software, while still being able to run Photoshop and Illustrator. Due to XP’s vulnerability on-line, I installed Xuntubu along side it, so I had a secure platform for surfing the Internet. Seriously if you have never considered Linux and you are moving away from XP, then I couldn’t recommend it enough. It’s free, open source and runs really well even on a system with limited resources. ‬I also discovered that interfacing my TRS80‭ ‬M100‭ ‬via serial is much less of a headache through Linux,‭ ‬than it ever was using Windows. For those of you that may have missed my earlier‭ article‭‬,‭ ‬I originally used an ABS plastic enclosure to house the Nomad.‭ ‬At the time I thought the case would be fine,‭ ‬but later discovered the motherboard was cooking inside the tiny case. So much that the hot glue I had used to construct part of the case has melted and one of the SATA cables was stuck to the underside of the top lid. Using a digital thermometer I’d built, I discovered the inside of the case was reaching close to‭ ‬85‭ ‬degrees‭! ‬Ouch‭! Once it had arrived, I began the process of transferring the guts from the old case to the new one. A month after the Nomad v2 was built,‭ ‬it randomly stopped working.‭ At first I wondered if my fears come true‭, that exposure to high temperatures in the old case had damaged the components, leading to the main board giving up the ghost. ‬Exhausting every theory, ‬I couldn’t figure out for the life of me what was causing the machine not to work.‭ ‬In the end,‭ ‬I took the‭ machine over to friend’s,‭ ‬hoping a fresh pair of eyes would see something I hadn’t.‭ ‬Thankfully this paid off,‭ ‬unlike me,‭ ‬my friend Peter went straight for the power supply.‭ ‬Not the one inside the machine,‭ ‬but the external brick I was using to supply‭ ‬12v to the computer.‭ I’d been so convinced heat had damaged something, I’d overlooked the simplest answer. I later realised I’d overlooked the load the Nomad was placing on the external power supply. ‬The motherboard,‭ ‬CPU and drives needed at least‭ ‬125watt’s and the power supply I was using fell short by a long way. ‬Before rebuilding the Nomad,‭ ‬I sat down and calculated the systems power requirements and bought a PSU and ATX Pico adaptor better suited to the system. ‭ ‭ ‬Overall the rebuild has been a success and I always get a special buzz when someone asks about the odd looking machine on the desk.